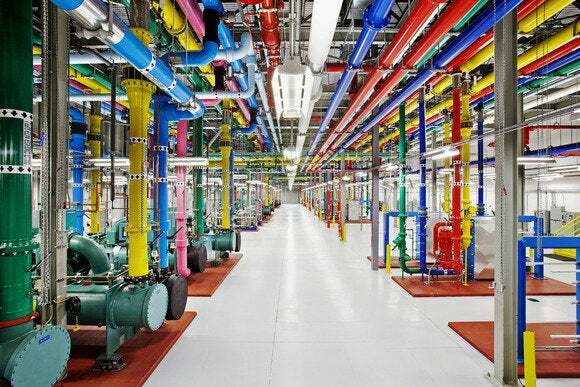 Google runs its services from some of the biggest, most sophisticated data centers on the planet, but it wasn’t always that way. Some of its top engineers have been reminiscing this week about the early days, when Google operated from a tiny server room down the hall from Altavista, and when Larry Page used to roll up his sleeves and fix its servers with a twist tie. Urs Hölzle, Google’s head of technical infrastructure, started the discussion on his Google+ page. His first visit to a data center was 15 years ago, he wrote, when Page gave him a tour of Google’s server room in a shared space at the Exodus data center in Santa Clara, California. It was a tiny space, or “cage,” 7 feet by 4 feet, with enough room for about 30 PCs. “This particular building was one of the first collocation facilities in Silicon Valley,” he wrote. “Our direct neighbor was eBay, a bit further away was a giant cage housing DEC/Altavista, and our next expansion cage was directly adjacent to Inktomi. The building has long since been shut down." A megabit of bandwidth cost $1,200 per month and was enough for about a million queries per day. Hölzle posted a copy of Google’s order form with Exodus, dated September 1998, including the prices it paid. A megabit of bandwidth cost $1,200 per month and was enough for about a million queries per day, Hölzle said. Google wheeled and dealed to keep its costs down. Page convinced the Exodus salesperson to provide some of Google’s bandwidth for “cheap” because it was for incoming traffic, while most of the data center’s other traffic was outbound, Hölzle wrote. Co-founder Sergey Brin chimed in on the post, showing how Google saved money by jerry-rigging its own hardware. “We improvised our own external cases for the main storage drives, including our own improvised ribbon cable to connect 7 drives at a time (we were very cheap!) per machine,” he wrote. Hölzle’s post was first reported by Datacenter Knowledge. They’re small details but the type that become the stuff of folklore in Silicon Valley. At a conference last week, Facebook’s Jay Parikh described how, in the social network’s early days, someone had to rush out to buy electric fans from Walgreens to keep its servers from overheating.